After taking things step by step in his career so far, towering target man Wout Weghorst is relishing the chance to challenge himself in the Bundesliga – and to follow in the footsteps of compatriot Bas Dost. Wolfsburg are banking on the recently capped Dutch international continuing where he left off with AZ Alkmaar. Wolfsburg had one of the most goal-shy attacks in the German top-flight in 2017/18, netting only 36 times after selling Mario Gomez – their 17-goal saviour from the previous year – to VfB Stuttgart. With top scorer Daniel Didavi departing in the summer along with Divock Origi, the Wolves added some bite to their front line – along with considerable height – by bringing in 25-year-old Weghorst. The 6'6" forward joined from Dutch side AZ, for whom he scored a whopping 27 goals in all competitions in 2017/18. Weghorst gets the majority of his goals from inside the area. He is sharp enough for a man of his stature, though, and stands out for his hold-up play as well as his finishing prowess. Coupled with his ability, however, it is undoubtedly the giant frontman’s drive and determination that have got him to where he is today. Following a brief spell with Willem II, Weghorst made the breakthrough with FC Emmen, who were then in the Dutch second tier. Predominately used as a substitute, the young striker still managed 19 league goals in two seasons there. After time on trial with German lower-league side Osnabrück, Weghorst ultimately decided to sign for Heracles in 2014. By that stage, comparisons with Dost - who stands at 6'5" - became inevitable. Weghorst’s compatriot, who had moved on to Wolfsburg by then, had taken the same route from Emmen to the Dutch top flight. It was around this time that the former Heracles and Borussia Dortmund coach Peter Bosz told Weghorst that his progression as a player depended on his ability to adapt quickly to life at a higher level. Luckily for Weghorst – at least so far – he seems to be quite at good at it. In his first season in the Dutch Eredivisie, he scored eight goals as Heracles steered clear of relegation trouble. His form earned him a call-up to the Dutch under-21 squad, and he savoured the chance to get advice from the side’s assistant manager at the time - former Benfica, Celtic, Nottingham Forest and Feyenoord star Pierre van Hooijdonk. It must have been wise counsel, since Weghorst netted 14 league goals the following campaign as Heracles finished sixth. He then led the line in the Dutch league play-offs, helping his club qualify for Europe for the first time in their history. It was with AZ that Weghorst would get his first taste of the UEFA Europa League, however, as that summer he took another step on the ladder by leaving Heracles for the two-time Dutch champions. As a replacement for the league’s top goalscorer Vincent Janssen, Weghorst’s first season there could hardly have gone better. Combining to devastating effect with rapid Iranian attacker Alireza Jahanbakhsh, he scored 17 league goals. 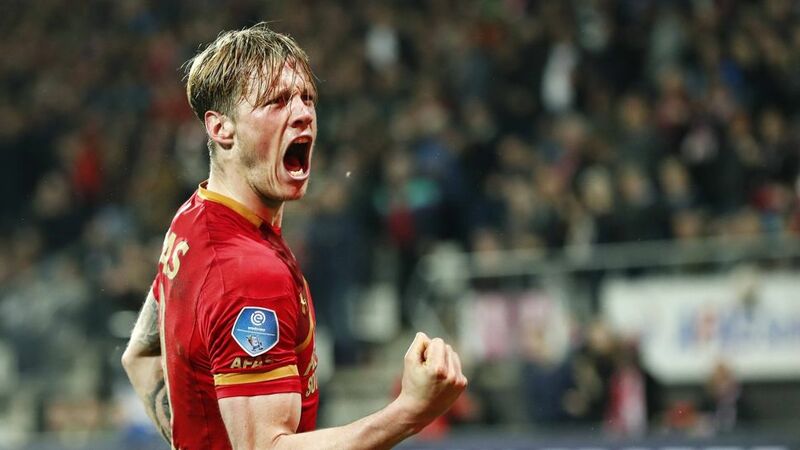 Weghorst would go one better in 2017/18 – and added six assists - as AZ finished third in the league, and he also scored nine goals in the Dutch Cup as his side lost in the final for the second year running. That kind of form could not go unnoticed, and the giant forward won his first cap for the Netherlands in a friendly against England in March 2018. Wolfsburg would make their move a few months later. AZ were sorry to see a man who scored 45 goals in 86 matches for them leave, but also recognised that he had earned his chance. “Wout has been important to AZ over the past two seasons and demonstrated as much with his goals and assists,” the Dutch club’s sporting director Max Huiberts said. Weghorst’s first move abroad would be a mere three-four drive from his home town of Borne. His fellow countrymen and Wolfsburg team mates Paul Verhaegh, Jeffrey Bruma and Riechedly Bazoer have no doubt made the transition smoother still. Describing himself as a hard-working team player, Weghorst will once again look to emulate Dost – this time at Wolfsburg. It remains to be seen if he will be as successful as the 2015 DFB Cup winner was with the Wolves, but his never-say-die attitude will give him every chance.